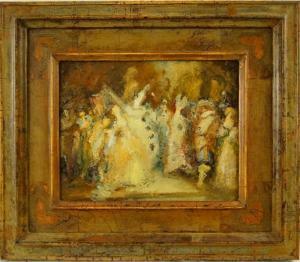 Find artworks, auction results, sale prices and pictures of Frederic Mathews at auctions worldwide. 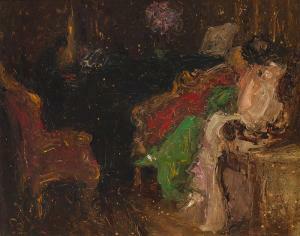 Frederic Mathews (1869 - 1941 New York, NY) Man playing piano for a woman in an interior Oil on board Unsigned, numbered on the estate stamp verso: 8 8" H x 10" W Condition: Visual: Generally good condition. Blacklight: Apparently no restoration under blacklight. Difficult to read under varnish. 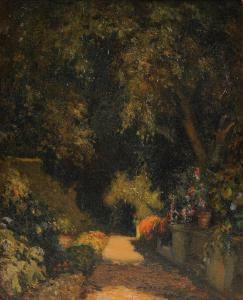 Frame: 15" H x 17" W x 1.25" D.
FREDERIC MATHEWS (American 19th Century) A PAINTING, "The Pathway," oil on board. 11 1/2" x 9 1/2"